FoxNews Should Introduce Karl Rove as the Anti-Perry Pundit From Now On | Virginia Right! Karl Rove has his face in front of the FoxNews cameras almost every time I turn on the Cable News Channel. Unfortunately, they are identifying Rove as an Analyst. Perhaps a fair and balanced (not to mention honest) description for Rove would be Anti-Perry Pundit. The man has absolutely fallen in hate with the Texas Governor and Republican Presidential Candidate. It is the worst kept secret in politics that the George W. Bush camp and the Rick Perry camp do not see eye to eye. There is an immense dislike for each other, though the “Bush” people seem to be the ones on the offensive. Rove has been floating the Sarah Palin candidacy at every opportunity. What this does is keeps Michele Bachmann’s softening support from jumping ship to a more viable Conservative – Rick Perry. And it effectively gives pause to former Tim Pawlenty supporters who prefer Palin over Perry. And for the more down tier candidates like Herman Cain, who is finished but won’t admit it, whose supporters are looking for a new guy. Rove is well aware that once these people who are supporting candidates more conservative than Romney finally make a move, it will be nearly impossible for Romney to get them to his camp. Rove is doing his level best to freeze the support in place and, at the same time, destroy Perry in hopes that Romney will be the last one standing. There are many who believe Rove is working for Romney. 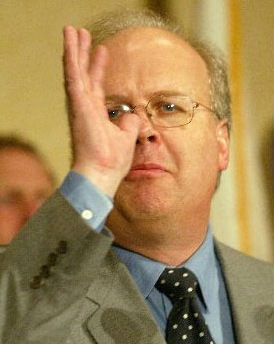 But the truth may be that Rove is not so much working for Mitt as he is working against Perry. Jeb Bush has come out and denied a feud between his family and Perry. And that may be true. It could just be that Karl Rove knows that his access to a Perry White House would be non-existent. Rove fears marginalization and extinction. We may be looking at a Rove-Perry feud as opposed to a Bush-Perry one. Whatever the case, it is very disingenuous of FoxNews to continue to allow Karl Rove a platform to continue his anti-Perry campaign under the cloak of “analyst”. Rove will always be welcome on MSNBC or CNN. And he will be free to destroy any and all Republicans on those stations. They will be glad to have another anti-Republican Republican token. And I am sure Rove’s first name gives people like Chris Matthews goosebumps.